Sri Lankan leader Mahinda Rajapaksa has declared the country “liberated” from Tamil Tiger rebels after a 26-year war. Sri Lankan television stations broadcast footage of a body purported to be that of Prabhakaran. Tamil media outside Sri Lanka have denied the army\’s claims that the Tiger chief is dead. After a day of feverish speculation over Prabhakaran\’s fate, Sri Lankan army chief Lt Gen Sarath Fonseka announced on state television that his body had been found. \”A few hours ago, the body of terrorist leader Prabhakaran, who ruined this country, was found on the battleground,\” he said, adding that it had been positively identified using DNA testing. Television pictures showed Sri Lankan troops standing over a bloated, uniformed corpse, whose face closely resembled that of the rebel leader. The forehead had been covered with a cloth, but the face was exposed, its eyes and mouth open. The footage also showed a copy of a military ID tag written in Tamil, bearing the number \”0:01\”, and what appeared to be a Tamil Tiger identity card bearing Prabhakaran\’s photograph. 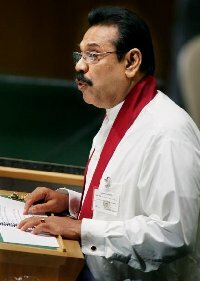 Earlier, in a nationally televised live address, President Rajapaksa hailed \”a day which is very, very significant – not only to us Sri Lankans but to the entire world\”. As he walked into parliament, schoolgirls sang an ancient song of praise, while lawmakers held up the national flag. After speaking in his native Sinhala, President Rajapaksa switched to the language of the Tamil minority, saying ethnic and religious divisions should end. The army said it killed Prabhakaran on Monday after over-running the last patch of territory held by the Tamil Tiger rebels (Liberation Tigers of Tamil Eelam, or LTTE). It said Prabhakaran, who founded and had led the LTTE since the mid-1970s, was shot dead with two senior deputies as they tried to escape. There were scenes of jubilation across the country as reports of Prabhakaran\’s death spread. Drivers and motorcyclists sounded their horns, while others waved flags and set off firecrackers. \”We are happy today to see the end of that ruthless terrorist organisation and its heartless leader. We can live in peace after this,\” said Sinhalese businessman Lal Hettige. However, the website TamilNet quoted LTTE diplomatic head Selvarajah Pathmanathan as saying Prabhakaran was still alive. \”I wish to inform the global Tamil community distressed witnessing the final events of the war that our beloved leader Vellupillai Prabhakaran is alive and safe,\” he said. Neither sides\’ claims have been independently verified because reporters are not allowed into the former conflict zone. The Tigers had been fighting for a separate state for Tamils in the north and east of Sri Lanka since the 1970s. More than 70,000 people have been killed in the conflict and thousands displaced. European Union foreign ministers meeting in Brussels condemned civilian casualties and called for an inquiry into alleged war crimes by both sides. UN Secretary General Ban Ki-moon\’s office said he was planning to visit Sri Lanka, but did not provide details.